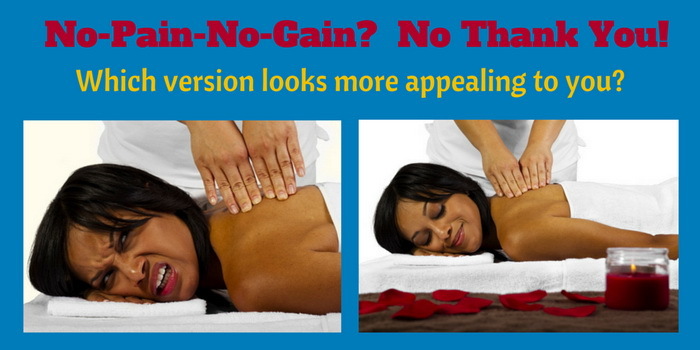 There are people out there who subscribe to the “no pain, no gain” theory in regards to Thai Massage. Interestingly enough a lot of the Thai people actually subscribe to that. Many massage therapists in Thailand have told me that their fellow countrymen often prefer really strong massage even if it is painful, but in contrast the foreigners prefer a gentler and non-painful approach. However I have also met a good number of Thais who will not get Thai massage because they have heard or experienced that it can be painful, and so they stay away from it. My personal experience has been that when I ask a Thai Massage therapist to work on a tight spot, they often will just press harder and use their elbows to dig deeper. But this has nothing to do with Thai Massage as a therapeutic system, but only with the way how it is applied. I have practiced and taught Thai Massage for over 15 years and I don’t hurt anyone. The fact is that Thai Massage lends itself to a strong application because it involves many stretches which can easily be overdone. It also makes use of elbows, knees and even feet, and unless the therapist is very sensitive, that can lead to pain too. I have studied in several Thai Massage schools where the teacher inflicted serious pain on the students all under the motto “no pain no gain“. Some of the students adopt or copy this style and propagate it as an advanced system. The fact is that some people like this hard approach, and for some people it really works and helps them. But it is just as possible to do Thai Massage in a more gentle way which is totally pain free. This is the approach preferred by the majority of westerners who don’t see the benefit of pain. I happen to be in this camp also. I want to emphasize that we are not talking about right and wrong or good or bad, but about preferences and options. There is a way to practice Thai Massage in a beautifully flowing, sensitive, and painless way. Many practitioners in Thailand are able to do that and that’s why it is important to clearly specify if you prefer a soft, medium or strong session. In my personal practice I have found that Thai Massage can be modified to include softer techniques like rocking motions which led me to develop my Thai Rocking Massage system. Many western practitioners have developed their own styles and combinations which often are great additions and improvements that lead to an evolution of Thai Massage. Since Thai massage originally came out of the yoga tradition, it makes sense to me to use yogic principles. Yoga stretches are not supposed to be painful and hard, but gentle, relaxing and opening. Yoga makes use of breath, perfect ergonomics, energy flow and higher awareness. Those same concepts can be applied to Thai Massage as well as to yoga. Unfortunately the yogic principles have been largely lost in Thailand. They have only recently been reintroduced by westerners who came to Thai Massage from the yoga camp and combined the two arts which were originally one system anyway. Those westerners also coined the term “Thai Yoga Massage” which is probably the most accurate description of this massage system. If you reconcile Thai Massage with its yogic roots, the question of pain or no pain clearly shifts to the no-pain camp. Hard and painful yoga practice easily leads to injury, and hard and painful Thai Massage will often produce resistance and tension in the body rather than relaxation. Without claiming to be right or better, I clearly join the camp of yoga, Qigong and Tai Chi practitioners in my application and teaching of Thai Massage. This results in a beautifully flowing dance between giver and receiver which is more of an art form than a mere technique. It focuses more on awakening energy flow in the body rather than stressing the body with hard stretches and strong pressure. It uses the spirit of yoga and the gentle power of softness to accomplish transformation and healing in body and mind. There is enough room in the world for different opinions, different styles and approaches. We just have to pick what works for us. It is not possible to please everybody all the time, but we can attract people who resonate with our choices and styles. There is a saying “If we would be all the same, it would only take one of us”. Or you can just say “Different strokes for different folks”. This applies to Thai Massage as well. The author, Shama Kern, has been living in Thailand for well over a decade and has been practicing and teaching Thai Massage for 15 years. He is the founder and director of Thai Healing Massage Academy. You have made excellent points with this article. I will add that it is counter-productive to force the body too quickly and/or with too much force. Pain is a definite red flag to the therapist and the client that the massage session is going too fast/too hard. In my experience, the body/mind/spirit likes to go slow, and will resist any forcing. Great article you have written. Keep up the excellent work! Registered Yoga Teacher with over 30 years experience, over 4 years experience as a Licensed Massage Therapist. Thank you Steve for your thoughtful response. I really value comments from practitioners who have a background in both massage and yoga. Your observation “In my experience, the body/mind/spirit likes to go slow, and will resist any forcing.” is exactly my experience as well. Yes, strangely enough there are some Thai therapists out there who refuse to consider that there are clients who do not subscribe to the ‘no pain, no gain’ model. What can I say….! A great testimony I must share to all cancer patients in the world. My husband was diagnosed with stage 4 primary liver cancer in March 2013. The doctor told us there was not much to be done since the tumor was 7 inches covering his lower lobe and also had spread to his lymph nodes. We decided to go home and called hospice which gave us morphine for pain. Ed hated the morphine which made him vomit and also affected his mind. After one week at home we decided to do what we have done for many years, rely on ourselves.We were only in Hospital for 3 days with severe Pain. The cancer had blocked his bile duct, after that we choose a Naturopath doctor and have not had conventional treatments. One day I came across the use of cannabis oil for treatment of cancer and I saw a post on how a cancer patient was cured with cannabis oil. I urgently needed help and I contacted the email :([email protected]) to get the cannabis oil, I was given instructional guide on how to use it. After taking a gram of oil per day, within a couple of weeks his pain and swollen stomach disappeared and with it came hope and a good quality of life. We never saw an ocologist and only have done a blood test after the first diagnose CT scan. His tumor marker went from over 6000 to normal and he is feeling well. We don’t know how this is going to play out, but enjoy every day and give thanks. As I am writing this post, my husband is free from liver cancer and the doctor confirmed that the cancer was cured permanently. For immediate assistance on every medical issue you and your family may be experiencing, contact Dr Rick via email: ([email protected]) for more information and the delivery process. Thanks for sharing your story. This is indeed amazing. I didn’t know about this – something to keep in mind! No sensitive massage is painful, no matter how they call it. The problem is ever the masseuse.